An all-natural nutritional supplement for livestock and show animal. Combines the benefits of fresh brewers yeast with other natural ingredients and minerals. 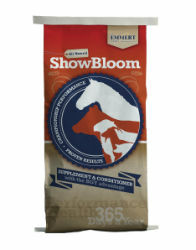 Including ShowBloom® in your feed program helps you give your show or companion animal all the brewers yeast it needs for complete and total nutrition. ShowBloom® contains more brewers yeast than any protein supplement on the market today. Use it to get the "bloom" of complete nutrition that will make your animal stand out. Aids muscle development and firmness. Produces outstanding hair growth and a shiny, healthy coat. Promotes healthy skin condition Improves hoof condition Increases feed intake and utilization.